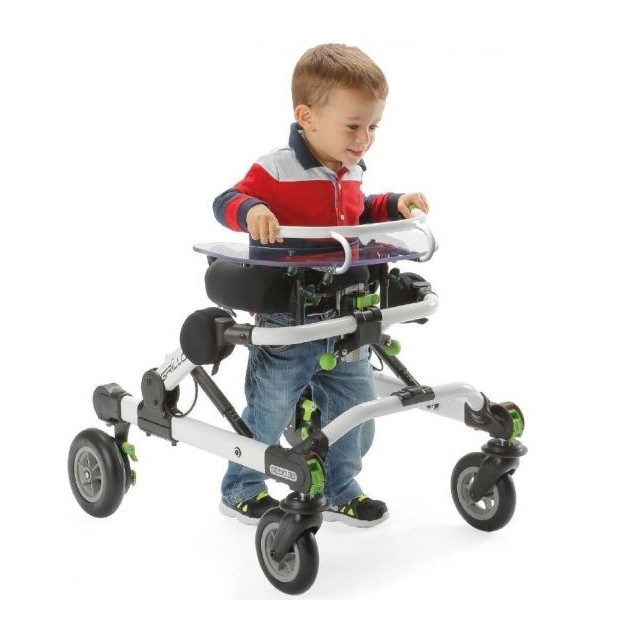 The walking frame for children Grillo Mini of the company Ormesa has aluminum frame, foldable for easy transportation. The walking frame Grillo has pelvic support padded, it is independently adjustable in height, width and circumference, allows an easy access thanks to the back opening. It gives the user a sense of security and stability, allowing him/her to concentrate only on walking without any fear. Graduated bars as a reference of height adjustments. Pelvic harness, ergonomic, comfortable, adjustable and easily for washing. It supports the user in case of necessity without generating painful pressures. Transparent tray adjustable in height, tilt and backward / forward position. Handlebar removable and adjustable in height, tilt and backward – forward position. It is used as a reference and as an armrest. Wheels light and puncture – proof. 2 front swiveling and 2 rear solid. Adjustable accessories: leg divider, pushing handlebar for care givers, wheels with pedals for parking brakes, grip handles fixed in place of the handlebar, grip handles (ordered separately).